“She learns each seed by heart, all similar yet none the same. Happy Sunday. Happy Easter. Happy chocolate eggs. I don’t want to go on and on right here about today’s featured artist, Eliza Wheeler, and her debut picture book, Miss Maple’s Seeds (Nancy Paulsen/Penguin)—which will be released this week—because she is visiting this morning to share sketches and art and tell us about her work. And I’m pleased she’s visiting and want to get right to it. I’ll say this much, though, before I hand the breakfast table over to her: Her book is the story of Miss Maple, tiny enough to get around on a bluebird and whose home is in a maple tree. Miss Maple gathers “orphan seeds” that get lost during spring planting; she nurtures them in her home, even during the winter months; and she then sends them off “to find roots of their own.” It’s a tender story with a big heart about the care that goes into nurturing living things — as well as the notion that even the smallest of such life needs our attention. “Take care, my little ones, for the world is big and you are small” is her repeated refrain, as you can see above. 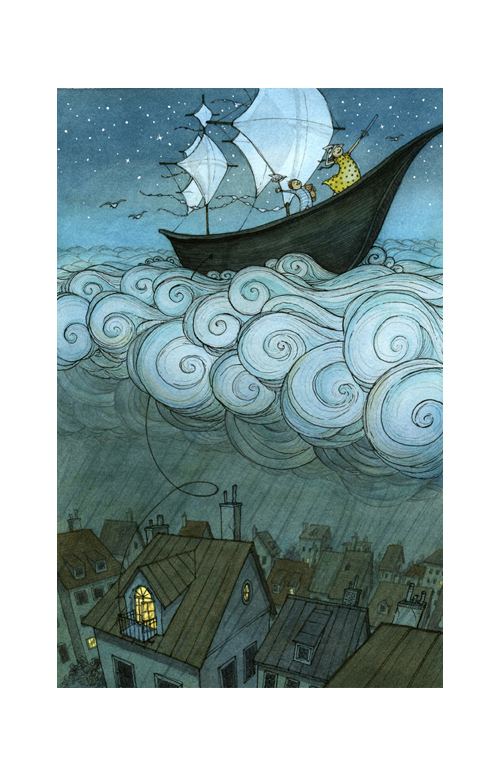 Wheeler’s art is delicate and warm, and she has created a detailed miniature world for her protagonist; these are inviting landscapes for young readers. Let’s get to all the art, and I thank Eliza for visiting. Later, I had the pleasure of getting to know my muse in person through the SCBWI Westside L.A. Illustrator’s group. Her name is Diane Browning. 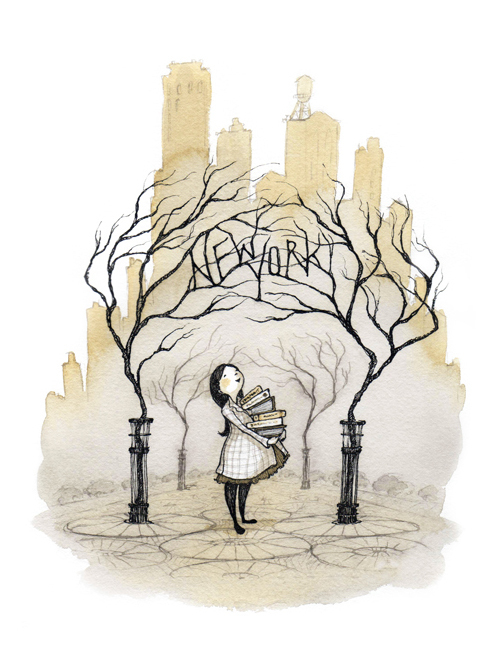 She’s as sweet as she looks and is a talented author/illustrator. It took about two years to get back to the idea, and in 2011 I began to sketch and explore who my character is and what she does. 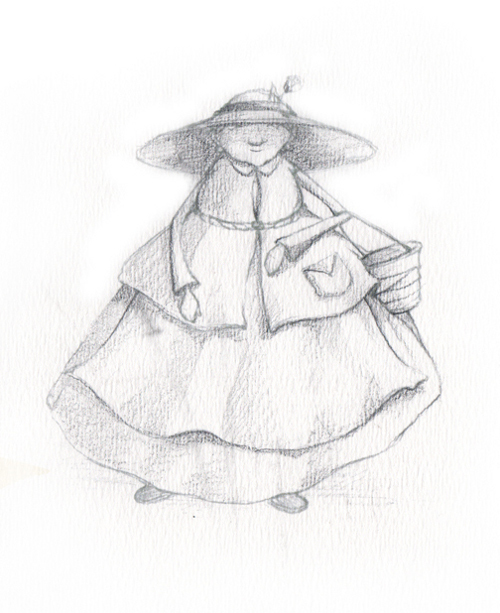 I didn’t see her as human size, but as a tiny woman who was something of a gardener. I eventually made a model of my character, which I used for reference. Through this process, I ended up exaggerating her features and giving her a large nose (for which I’ve since apologized to Diane Browning, who’s nose, I should say, is lovely and petite). I wanted her to feel like the teacher or grandmother we all had (or wished we had). 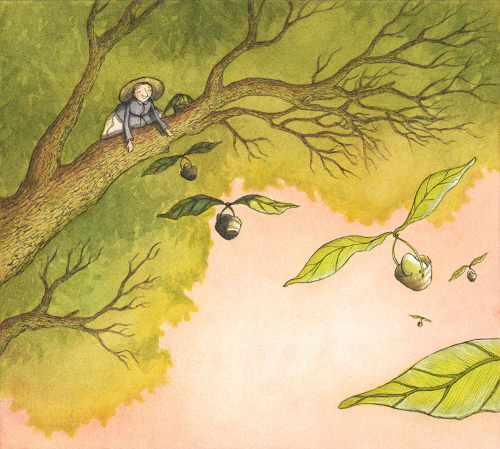 Ever since I was little, I’ve had an obsession with doll-sized people living in trees. I don’t know exactly where it started, but was I surely influenced by the homes of the Berenstain Bears and Winnie-the-Pooh characters. I combined my seed-saving character with my childhood inspiration, and that’s when Miss Maple’s story began to come to life. 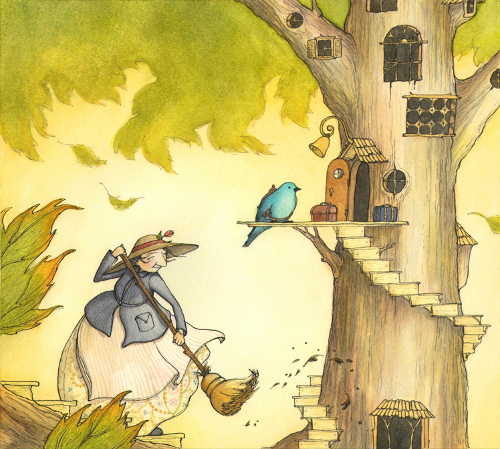 “On a bright August morning, Miss Maple flies home. I wrote the story in about a week (an experience I have yet to duplicate), and it took a month to create a dummy for the book. 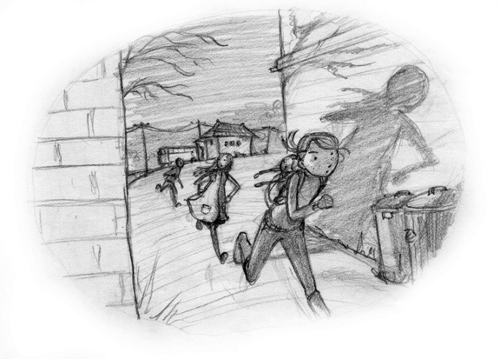 I shared the dummy with Cecilia Yung, my SCBWI mentor and the Art Director at Penguin Books, who connected me with my editor, Nancy Paulsen, and the three of us worked on revisions to make the story so much better. 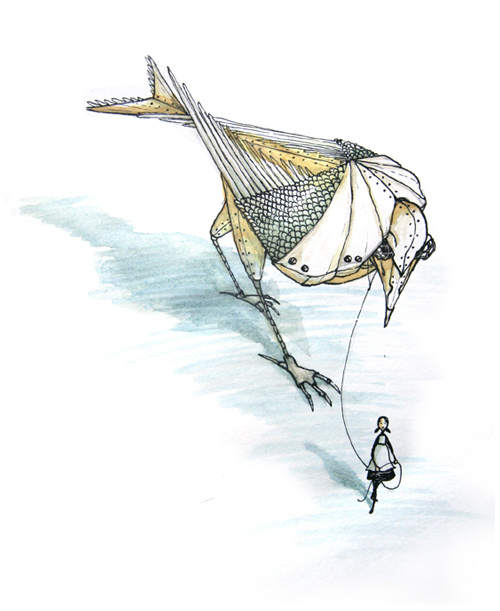 I sketch in pencil, and my final artwork is pen and ink, and watercolor. The cover was the last piece that we worked on. 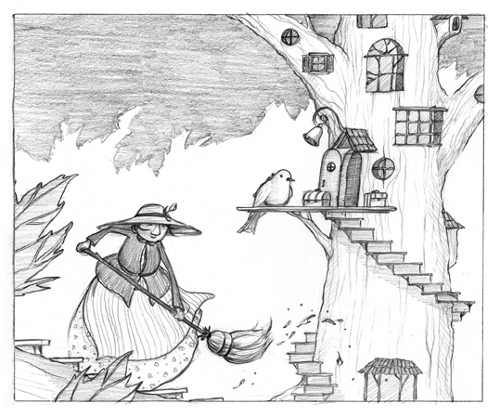 I gave Nancy and Cecilia a few thumbnail options, and we felt that the scene of her flying with the seeds would have the most movement, making a more eye-catching cover. The working title at that point was The Maple Tree Orphanage. 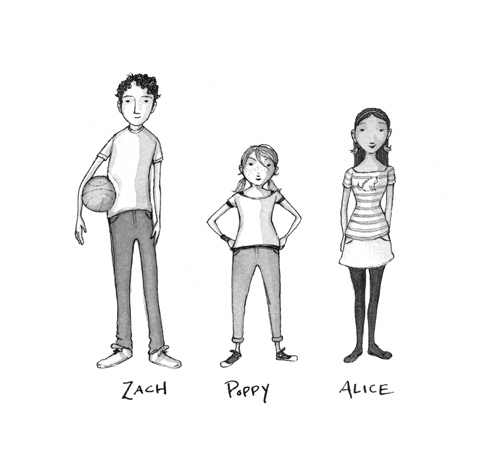 The book launches this week — on April 4th [from] Nancy Paulsen/Penguin Books! 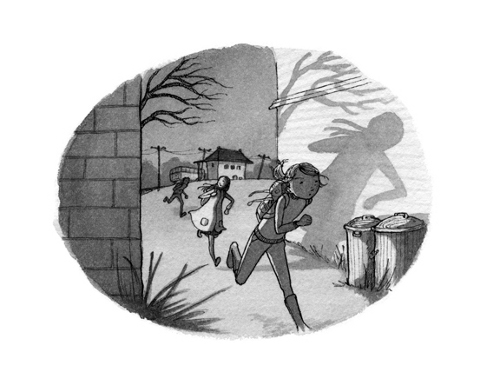 In addition to picture-books, I create illustrations for middle grade novels and had the honor of working on Holly Black’s new middle grade, Doll Bones (McElderry Books/Simon and Schuster, May 2013). This was a super fun project to work on! I read the manuscript and worked on character development (which my agent, Jen Rofé, gave me a lot of helpful feedback on). …then created a full sketch based on the one we liked the most — and then moved on to the final image. Other projects coming down the pipeline include interior illustrations for Maryrose Wood’s The Incorrigible Children of Ashton Place, Book IV (Balzer + Bray), with cover art by Jon Klassen, and a new Kate Milford novel, called Left-Handed Fate (Holt Children’s/MacMillan), a nautical fantasy set in 1813 about the wars in the Atlantic. 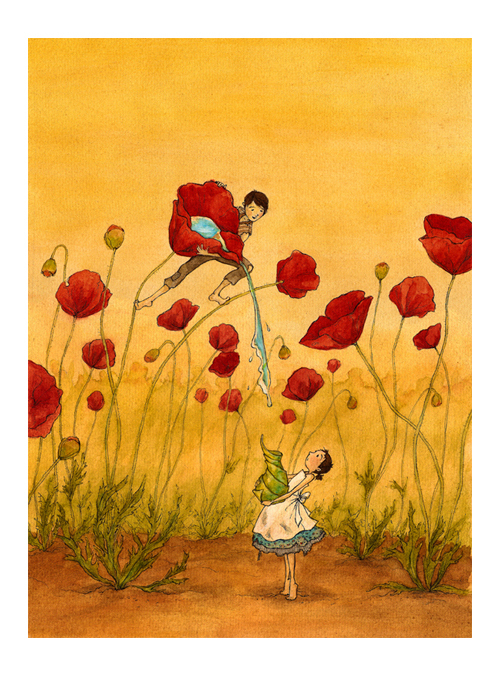 A huge thank you to Jules for featuring my artwork on Seven Impossible Things, a wonderful source of inspiration for the children’s book community! Thanks to Eliza for visiting, but wait … wait … I’m not done! I don’t know about you, but I’d read an entire story about that malevolent rodent. MISS MAPLE’S SEEDS. 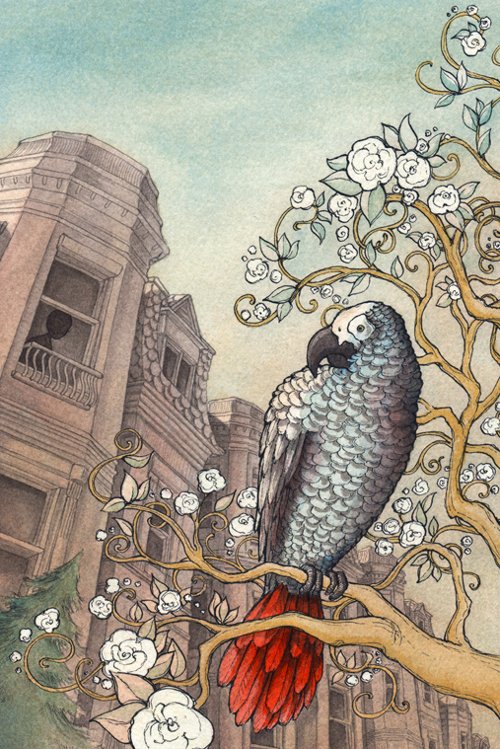 Copyright © 2013 by Eliza Wheeler. Published by Nancy Paulsen Books/Penguin, New York. All images here reproduced with permission of Ms. Wheeler. Viewing Zero Dark Thirty I kept waiting for Maya’s story to sideline into one of the subplots typically tacked onto a female professional protagonist. But no love interest turned up. No one questioned her about any maternal yearnings, and her “womanly” emotions never got in the way of her work. Because I find these are often dull and sometimes flat-out offensive, I was elated when I realized Bigelow [the director] had rejected these standard “women” stories. I mean, really. It’s unusual to see this in films. 2) This a cappella cover of the theme from Game of Thrones (what I think is a really kickin’ piece of music) is lovely. Let’s pretend I do have cable and will be watching the premiere of season three tonight. La la la I’m pretending. 3) This says it all. Leave it to McSweeney’s to make a point so incisively and cleverly with so little. 4) The very dark chocolate brownies with coconut oil that my friend baked. 6) Watching my daughters master the art of the poker face. 7) I really like Eliza’s art. Clearly. I hope those of you who celebrate Easter have a great one. What are YOUR kicks this week? Anyone around? I’ll be back later to read kicks — after I hunt for some eggs. Jules: I haven’t seen Zero Dark Thirty yet, but I plan to – and I’m delighted to hear that they didn’t give her a love interest. YES. 4) Auditioning for a film today! Quick hop by to say Happy Easter! 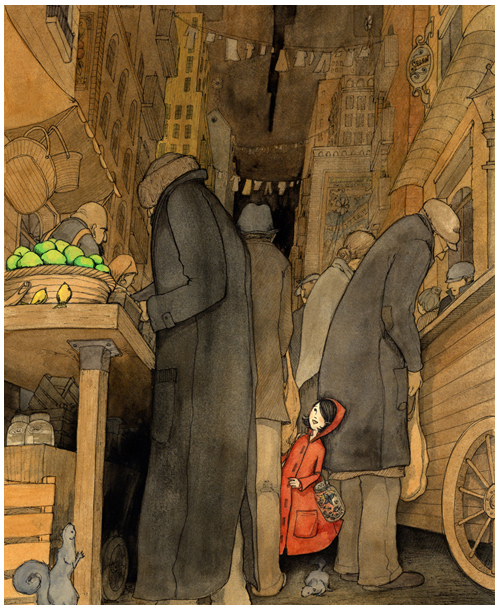 Love Eliza’s work, so life affirming. Can’t wait to see Miss Maple. Did somebody say chocolate eggs and dark chocolate brownies made with coconut oil? Jules ooh to dark very dark chocolate brownies w/ coconut oil. Must see Zero Dark Thirty. Glad to be well, last Sunday I had the flu. Easter with Grandgirls in Medford. LOVED Eliza’s wee Miss Maple. And her other art. 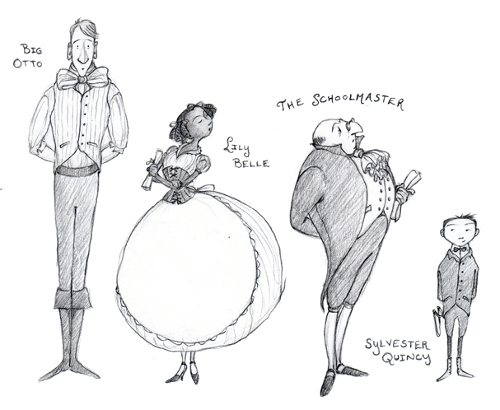 Two quick notes: (a) Very interesting, watching how different illustrators move from sketch to final. Eliza seems to make very few changes in the composition, perspective, and lighting of the original, just does it all better. 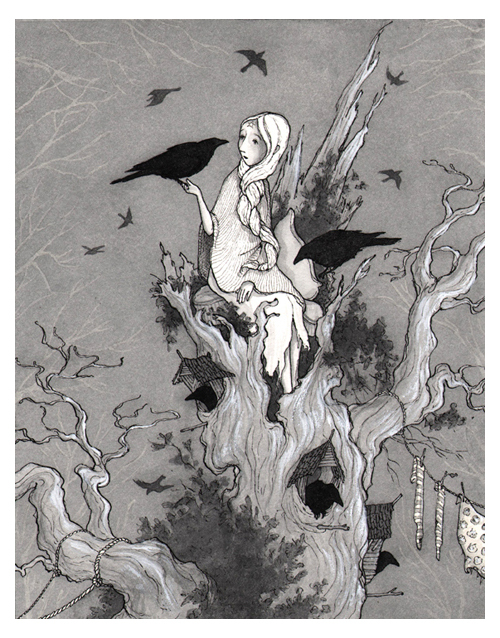 This suggests that a given illo emerges from her fingertips pretty much just right, from the outset. Amazing. 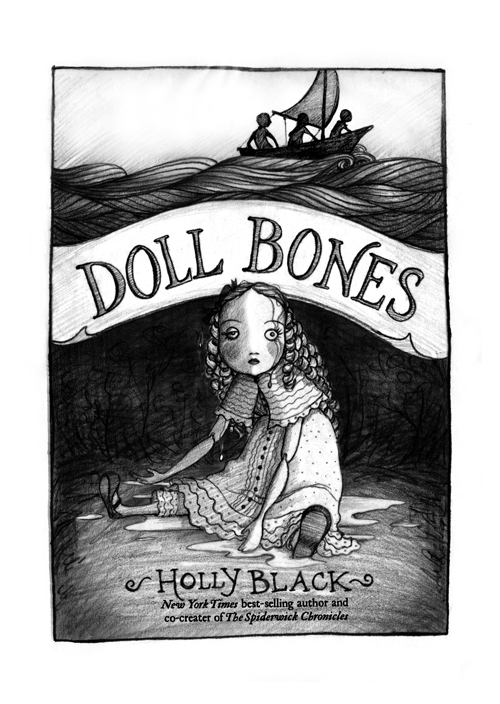 (b) Look at that cover for Doll Bones (sketch or final, either one). A demonstration of little things meaning a lot: look, specifically, at the doll’s right hand. That it’s turned palm up makes all the difference. I don’t know the book’s storyline, but that pose says to me something like: Inert. For NOW. Hi, jama — good poker face, I didn’t even see your eyebrows twitch. I swear. Have fun with the grands, Jone! 2. The Pooch got her sunken-living-room ramps this week. Remind me to tell you about that sometime, but it qualifies as a Kick. 3. Potential gold at the end of a 20-some-year-old rainbow. 4. 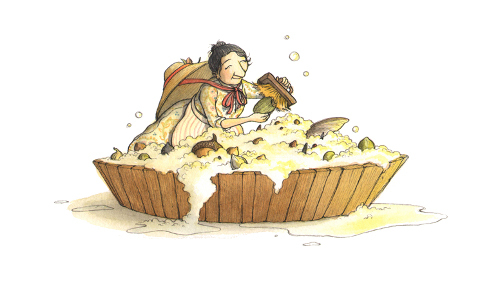 The Missus’s scallops-and-garlic-and-LOTS-OF-LEMON-and-Worcestershire-and-dark-bread recipe. 5. The Oatmeal, on why and how much to tip a waitress. 6. Michael Dibdin’s Ratking (NOT a kid’s book! ), which started slow but has grown on me. 7. Saw the documentary about Terry Gilliam’s (failed) Don Quixote-based film. Crazy-funny and heartbreaking. 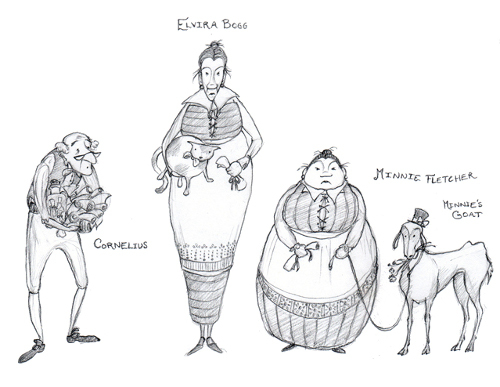 Love Eliza’s elegant and witty work! Hi Jone! Have fun with the grands, with writing, and with the week. JES: You mean like watching all five episodes of Torchwood: Children of Earth in a row? Because that happened. Oh boy! Another wonderful book to love. 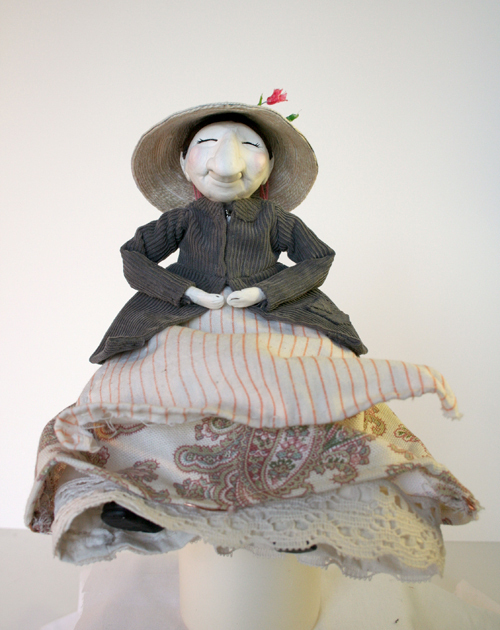 Thank you for sharing your inspiration, the making of the doll and the artwork, Eliza. I especially like the bits of red in some of the pieces. Your detail work is amazing. Jules: My heart melted when I read what your daughter said about the smell of you and your clothes. Little Willow: You can’t beat the healing power of sleep. 1. Even though snow is in the forecast lots has melted. 2. I can hear birdsong in the mornings now. 4. My spring cleaning is done. 5. A new poetry book to read arrived. LW – am I that transparent? Yes. EXACTLY like that. Although of course you could substitute 12 episodes of Firefly, or all the episodes of The Killing’s first season, or… In fact, I remember a time (he said, putting his feet up on the cracker barrel and launching one at the spittoon) when we were recording EVERY EPISODE OF THE X-FILES when they were first broadcast. Those d*mned tapes followed us around for years. JES: You can’t take the sky from me. I need to see more episodes of Torchwood. Margie (and Xena!) Except for the part where, when I actually DO sleep for more than six hours, I’m tired. I admire Eliza’s artwork and am so exited to see all the work she is getting. Her career is really taking off and I’ve only met her a couple times, but I always share her joy of her accomplishments! She will do well, no doubt. JES: Kaylee shares my energy. Simon, I admire for his smarts and loyalty. I’ve quoted both River and Wash on multiple occasions. And yes re: Torchwood. It’s rarely on when I’m home. Ianto… sniffle. 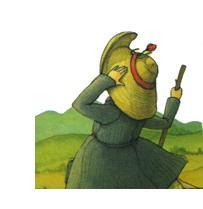 I liked hearing the story of the book’s inspiration: an adorable woman in a bright hat sticking out of the crowd. 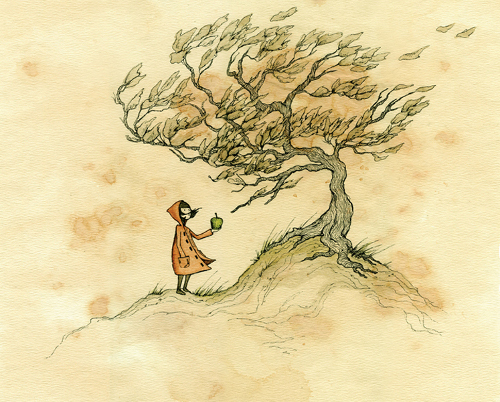 I also lurve Eliza’s illustration of Miss Maple reading flower tales… with the fireflies… and the seed beds… and the birdie outside with wing over its beak. 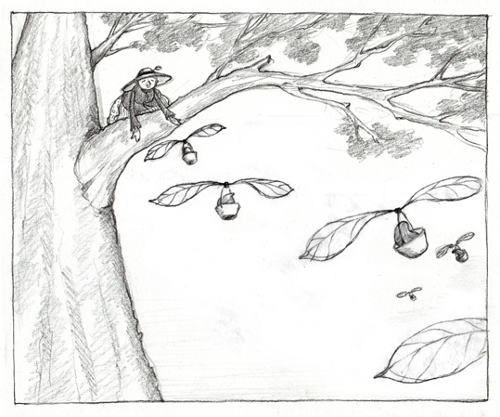 I share Ms. Wheeler’s obsession with doll-sized people living in trees. When my boys were little I used to buy fairy figurines and semi-hide them on fishing line dangling in the tree tops around our house. 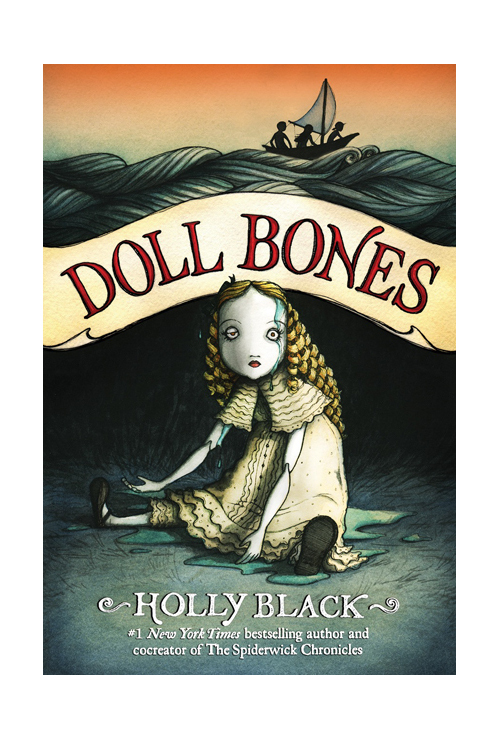 (tee-hee) RE: Doll Bone’s cover: JES likes the palm’s up gesture (me too) but I was struck by that half-a-blink broken dolls’ eye – sad/creepy/pretty/still watching. Jules — Kathryn Bigelow is my hero. That a cappella piece is very cool-eerie. Next time I’m writing a cool-eerie story, it’s gonna be my writing soundtrack. McSweeney’s is a McSmartass in a such good way. Thanks for sharing Miss Maple’s Seeds. LW – chats w/squirrels. ha! of course you do. jone – spring break, grand girl outings and reading books seem a good combo. 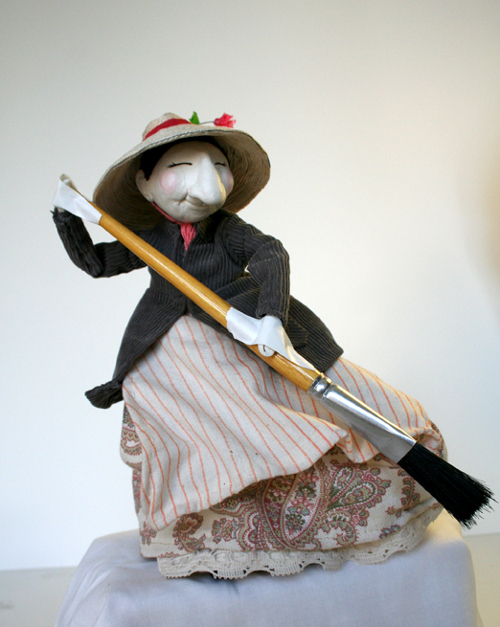 Margie – snow’s only partially melted and your spring cleaning is DONE? hats off. 1) our crayon-drawing, dye-dipping egg decorating tradition—a whole evening’s endeavor. 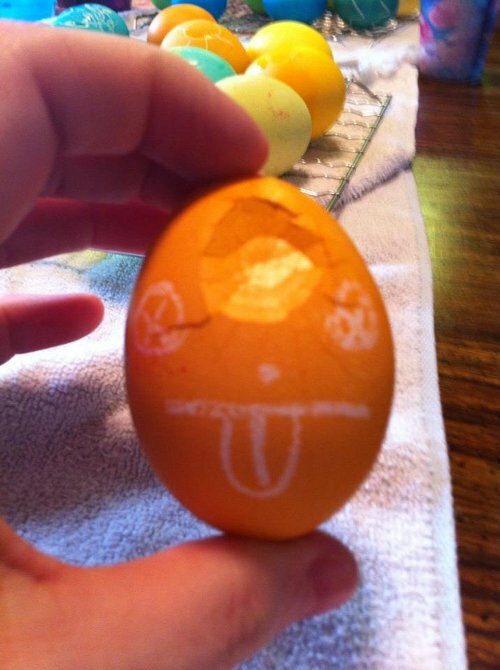 2) My high school son’s a-MAZE-ing egg: the whole Cretan Labyrinth myth—Minotaur, Daedalus, etc.—on one egg. Hypnotic and hysterical. Quote written in tiny letters, mid-maze, “Day 4: I think I lost the Minotaur but still no sign of Ariadne’s string…” ha-ha. weird kid. 3. Guests tried their hand (having never drawn on an egg before) to lovely cubism results. 4. My husband tried some odd “burnishing effect” which also turned out well. 6. I’m reading “Three Times Lucky”. Great spunky voices in this book. Having lotsa fun. 7. Tried a new birdseed mix and WOW my birdfeeder is a local hit. I see 6 doves, 2 finch and several sparrows out there right now. Plus (of course) a squirrel sitting on the ground underneath eating the spillover (since he’s thwarted by my clear dome squirrel guard.) I’ve seen him doing some impressive acrobatics trying to get around it. Have even seen him “scolding it” in frustration. Perhaps that’s how Bad Squirrel went bad; squirrel guard-frustration turned him to the dark side. ha-ha! That’s it for me. Have a good spring week everyone. A huge thank you to Jules for featuring my work so beautifully – and for all the wonderful words of praise! I LOVE Seven Impossible Things Before Breakfast. And thank you’s to everyone here commenting on my work; it makes such a difference to hear your positive responses. I’m EXTREMELY honored. 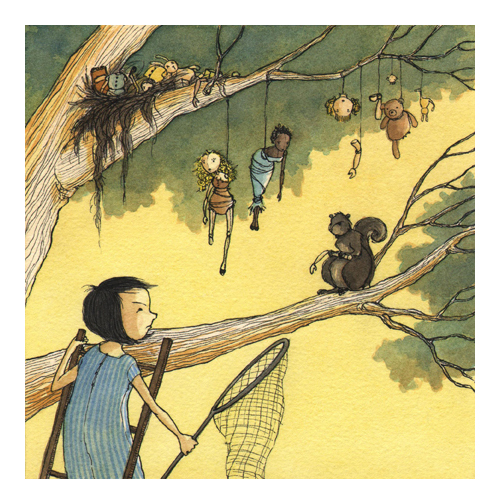 BTW: the Evil Squirrel piece at the end was specifically created for my illustrator friend Debbie Ohi (debbieohi.com), who has an on-going war with squirrels, and is overall an amazing and generous friend. Jules – thank you, again!! LW: I like “Super” as a kick. Jone, glad you’re feeling better. Your ears will burn tonight. I’m speaking to library school grad students about blogs, and I’m going to show them your site — as an example of a school librarian who blogs. John, that’s actually the reason we don’t have cable — that and a few other reasons. I just wouldn’t have time. Did you enjoy your mimosas? Mmm. I’m definitely curious to hear about the Pooch ramps. Margie, I hope the snow goes away soon (unless you’re still enjoying it). Also, your ears will burn tonight, too, during my presentation! …. There’s not much that’s better than a new poetry book, waiting to be cracked open. Eliza, thanks again for visiting. Love the story behind the Evil Squirrel piece. poor egg got it right between the eyes, ha-ha! LOVElovelove this post. I adore Eliza’s work. 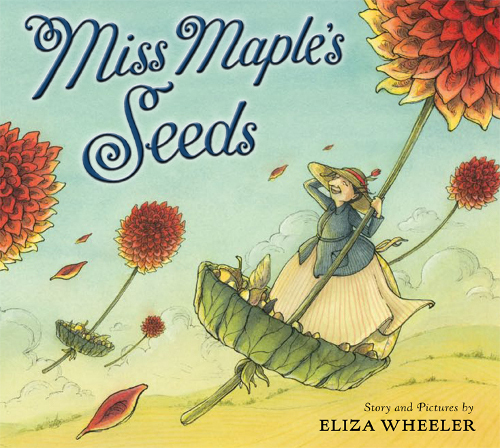 I can’t wait to buy my own copy of MISS MAPLE’S SEEDS!! Great post like every week. Thanks!! Debbie: How funny! I am going to send that to a friend whose had a flying squirrel problem in her home for a while now. Denise, yes, the link works. I love that egg. Thank you, Jules. I am late for posting a student poem today. Was traveling. Wow, this book looks beautiful! I can’t wait to read it. Wow, your art is beautiful !